Ever look in the cupboards and repeatedly close them looking for something to eat? The pantry is full but it feels like there’s nothing to eat! You need a pantry purge! There are lots of ways to go about getting rid of stuff in your pantry. You could set aside a whole afternoon to take everything out, assess it, and only put back what you’re actually going to use. Compost anything that has gone bad and donate anything that you know you’ll never use. If that feels like too much work or requires too much planning ahead, I recommend doing a mini purge of your pantry! Welcome to the Mini Pantry Purge! 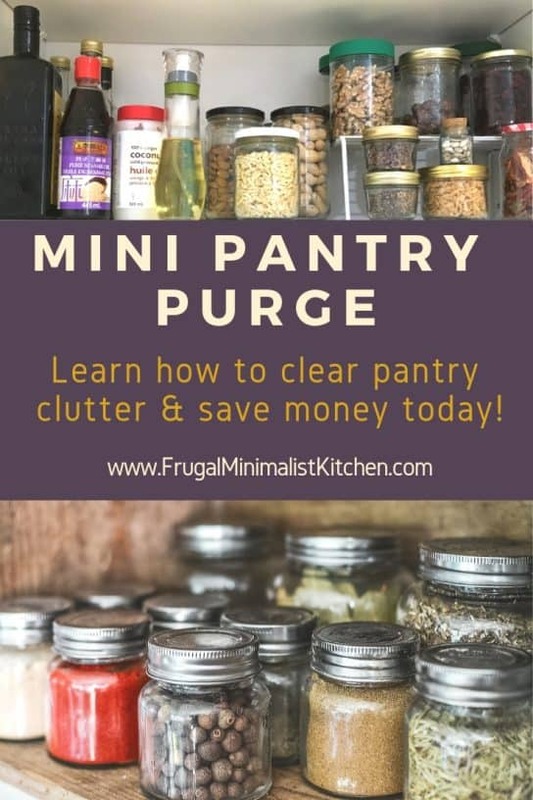 The mini pantry purge will help you clear out the clutter from your pantry, reduce food waste, and get inspired to try new recipes! I’ve broken down this pantry purge into micro steps so you never feel overwhelmed, or like you need to procrastinate. Each task will only take 5-10 minutes max. I’m going to keep this short so you have more time for taking action on the things that are important to you. Choose a cupboard or shelf you want to tackle. Remember to start small! This shouldn’t take more than 5 minutes max! If you feel overwhelmed or it’s going to take more than 5 minutes, start smaller. Pick a single shelf or section. You can also just focus on one type of food, like canned foods, or whatever you feel compelled to get at! Look through each item in the cupboard and check it’s date. If it’s passed due or close to it’s date, set it aside. Also set aside any items you don’t know what they are or things you tried once but never touched again. Use a small basket or designate a section of the cupboard for these items. Compost anything that has gone bad and recycle the packaging. This step is optional, but highly recommended! Rearrange the remaining items so you can easily see what you have. Put items with longer best before dates to the back, and shorter ones to the front. This will help you use them up in order and avoid food waste. Now that you went through a cupboard or shelf in your pantry, tossed anything that was no longer good, and set aside things that need to be used up soon, you need to do something about those items! I want you to choose at least one item to use up, then find a recipe that uses that item. If there are a few items that might go together, you could try to find a recipe that uses multiple ingredients. For example, tomato sauce and lentils to make lentil bolognese. I like to use allrecipes.com for this because you can search for recipes based on ingredients. So handy! Find a recipe that uses other ingredients you have on had and commonly use. You don’t want to have to buy another new ingredient that only gets used once! Alternatively, it you want to get creative, you could try a Chopped Challenge. This is like the TV Show where you get a basket of seemingly random foods and try to make a meal out of them. It could be a fun family or date night! The last step is to make the recipe you found and use up those ingredients! You can repeat this practice as often as you’d like. Taking mini steps towards your goals is the most sustainable way to make change and build lifelong habits! 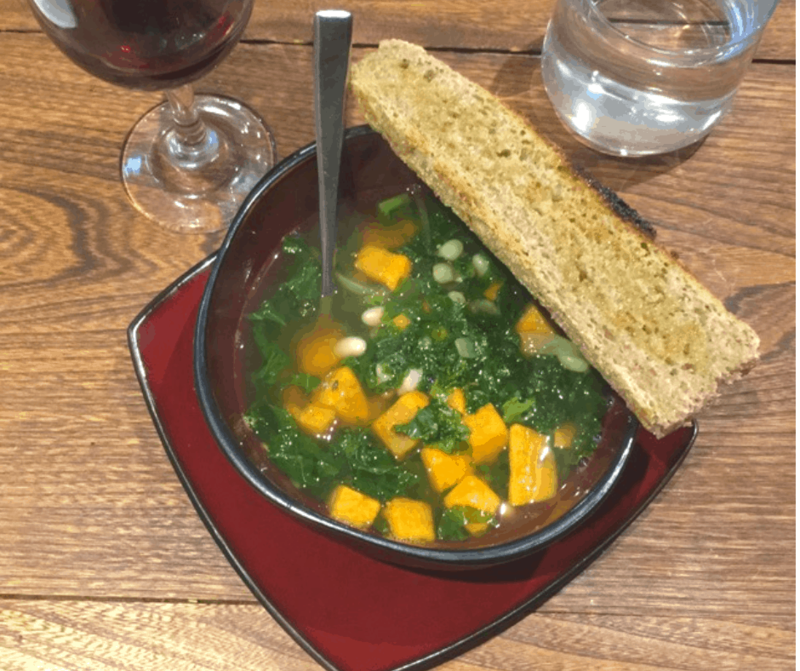 This Tuscan White Bean & Kale soup helped me use up some dried beans! If your pantry is super cluttered right now, try to use up at least 2 items for every one new item you bring in. This will help you eventually tame it. Once your pantry is manageable, you can have more of a “one in, one out” philosophy. I keep my cupboards mostly under control by doing this little routine regularly. I don’t make it a formally scheduled thing, I just make a point to check the dates periodically and use the oldest one up first. There’s not usually much to throw out because I keep rotating the new with the old so stuff doesn’t get forgotten about in the back of the pantry! If I have a food item I don’t know what to do with, or accidentally bought multiples of the same thing, I make a point to use it up asap. Perhaps you are a sucker for discounts on case lots, marked down items, or optimistically buy new things to try but never get around to actually using it. The whole point of this challenge is to take a small step to manage the clutter in your pantry without getting overwhelmed. 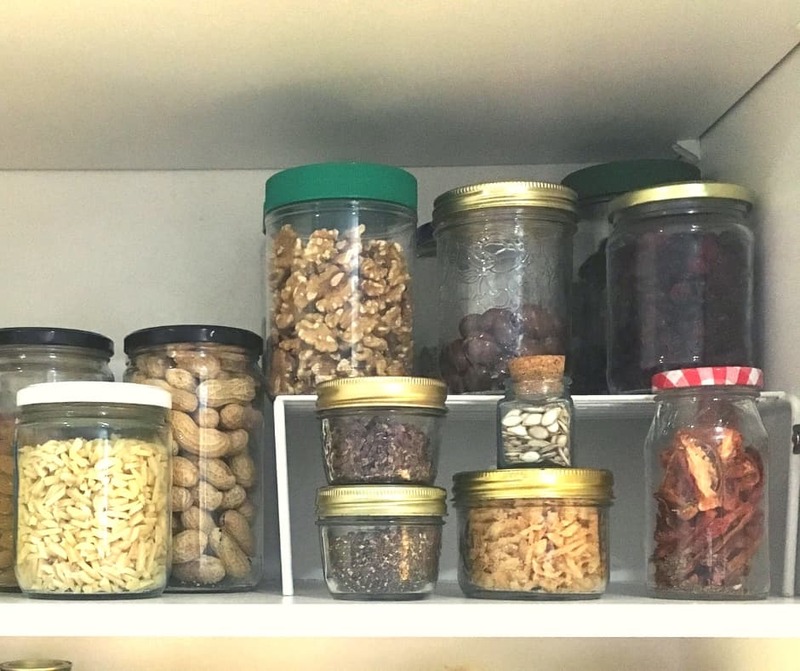 Using this technique every week or few weeks, depending on how your pantry looks, will help you develop a habit of regularly using up pantry items. It will also help make you aware of your habits that cause this in the first place. 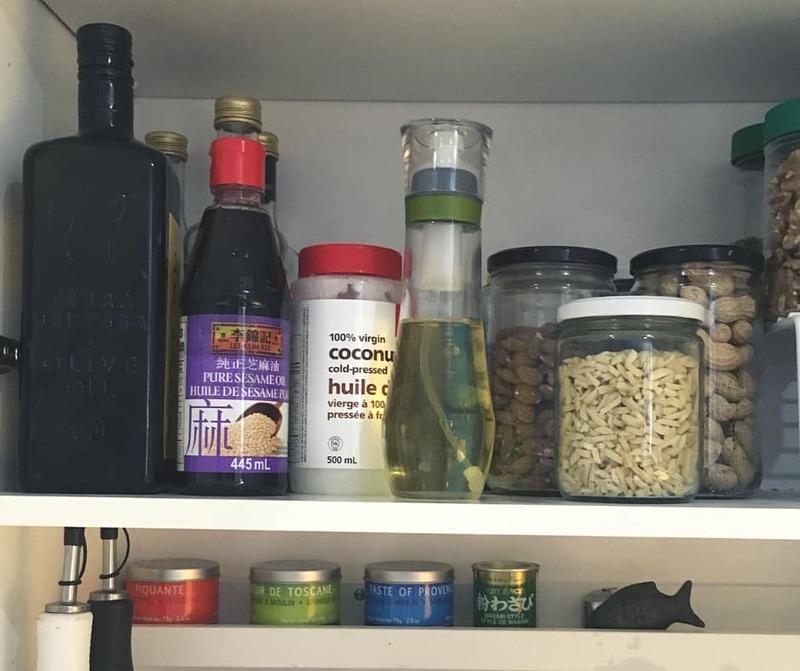 Whatever the reason your pantry is the way it is, take a few minutes to use up what you have and make a mental note to help prevent it from happening in the future. It will help you save money and reduce the stress of having a cluttered pantry. Leave a comment with what you cleared from your pantry!